Good Conductors: Electric current can easily pass through some materials. Such materials are called good conductors of electricity, e.g. iron, copper, silver, aluminium, gold, etc. Bad Conductors: Electric current cannot pass easily through some materials. Such materials are called bad conductors of electricity, e.g. rubber, wood, asbestos, plastic, etc. LED: It is the abbreviated form of Light Emitting Diode. An LED is enclosed in a glass housing; with two wires (called lead) coming out). One lead is slightly longer than another. An LED can glow even in the presence of weak current. Heating Effect of Electric Current: When electric current passes through a conductor, it increases the temperature of the conductor. This is called heating effect of electric current. Many electrical appliances work on heating effect of electric current, e.g. electric bulb, water heater, electric iron, etc. Magnetic Effect of Electric Current: When electric current passes through a conductor, a magnetic field is created around the conductor. This is called magnetic effect of electric current. This can be demonstrated by keeping a magnetic compass near a current-carrying conductor. A magnetic compass shows deflection when it is placed near a current carrying conductor. The devices which work on magnetic effect of electric current are: electric motor and electromagnet. Liquids which are good conductors: Some liquids too can conduct electricity, e.g. tap water, lemon juice, vinegar, salt solution, etc. Most of the liquids which conduct electricity are solutions of acid, base or salt. 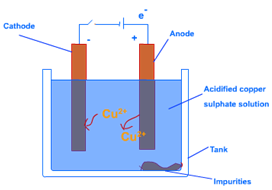 Liquids which are bad conductors: Some liquids are bad conductors of electricity, e.g. distilled water, honey, milk, vegetable oil, etc. Tap water conducts electricity because it contains various salts dissolved in it. Hence, it is advised not to touch an electric switch with wet hands. In 1800, a British chemist, William Nicholson showed that when electrodes were immersed in water and current was passed through water; bubbles of oxygen and hydrogen were produced. Oxygen bubbles were formed at the electrode connected to the positive terminal. Hydrogen bubbles were formed at the electrode connected to the negative terminal. Bubbles of gas may be formed at electrodes. Deposits of metal may be seen on electrodes. Change of colour of solution may occur. The material which needs to be coated with a layer is made the negative electrode (cathode). The plate of desired metal is made the positive electrode (anode). The conducting solution is made of a salt of desired metal. Electric current is passed through the solution. The desired metal dissociates from the plate (anode) and gets deposited on the material at negative electrode (cathode). Imitation jewelry is made by applying a layer of gold or silver. Applying a layer of chromium on an article by this method is called chrome plating. Parts of bicycle, motorbike and sanitary fittings are chrome plated by this method. Tin cans are made by electroplating tin on iron. Applying a layer of zinc on an article is called anodizing. Electric poles and beams on bridges are electroplated with zinc. Chrome plating and anodizing helps in preventing from corrosion. Problem of Electroplating: Electroplating results in production of many harmful chemicals. Disposal of these chemicals is a big problem.